The result of four years of research, the Elytra Filament Pavilion is inspired by the fibrous forewing shells of flying beetles known as elytra. 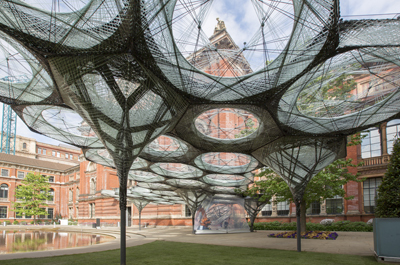 Featuring components which have been fabricated by a robot at the University of Stuttgart and then assembled on site in the V&A’s John Madejski Garden, the installation will grow and move in response to how visitors use the canopy thanks to anonymous data collected from sensors installed in the canopy fibres. On select dates – 17th and 18th June and 22nd September – visitors will be able to see new cells – each of which weighs about 45 kilograms and take an average of three hours to create – manufactured live by a Kuka robot. The installation is the work of experimental architect Achim Menges with Moritz Dorstelmann, structural engineer Jan Knippers and climate engineer Thomas Auer. 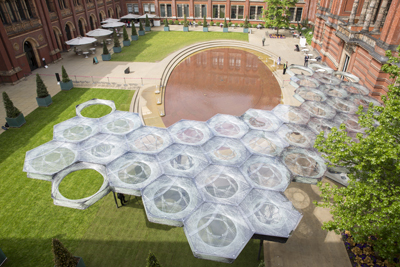 The pavilion is one of the highlights of the V&A’s first ever ‘engineering season’ with the landmark exhibition – Engineering the World: Ove Arup and the Philosophy of Total Design opening on 18th June. Admission to see the installation, which can be seen at the South Kensington location until 6th November, is free. For more, see www.vam.ac.uk/EngineeringSeason. PICTURES: © Victoria and Albert Museum, London.